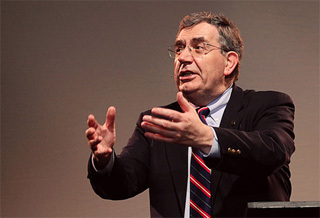 The messages by Dr Ferguson on Romans 5 and 6, were nothing short of a theological thrill. A stimulus for the mind and a feast for the soul, I left both full of ‘matter’ and worship. Yet as the dust settles today, one line from Dr Ferguson seems to be lodged in my mind. I am sad to say it is not some weighty truth about the nature of justification by faith or our union with Christ! Instead what I cannot shake is a brief parenthesis Dr Ferguson made. One of those “throw away” comments that is anything but throw away. Dr Ferguson referred to the danger of the “Where’s Waldo” Hermeneutic. And he warned of its alarming frequency in modern preaching. Before going any further, I really should check that you know who Waldo is. Waldo is that little fella in the red striped jumper, with eyes bulging behind those thick, round glasses. In the series of “Where’s Waldo” books, he appears in scenes of massive crowds. The aim of the game is to find Waldo somewhere among the masses. It can be struggle to locate him. It can take many minutes. But you know that somewhere in the throngs of people, Waldo must be in their somewhere! Back to Dr Ferguson. His point was that many preachers use a Where’s Waldo hermeneutic. They are studying a Gospel, say, and they’re reading a passage about Jesus, the disciples and the crowds. Their immediate instinct is not to focus on Jesus. Their immediate instinct is bridge the gap to the congregation by finding ​them ​in the text. The congregation is Waldo, and they must be in the passage somewhere! But one things for certain, our congregation must be in the text. The truth is, our congregation isn’t. Our congregation is nowhere in the Gospels, or anywhere else in the bible. They live 2000 years later. They are not in the 9th chapter of Luke! This is not to say that we cannot at times carefully observe parallels between biblical characters and ourselves today. Or that we cannot correlate the words and actions of biblical characters to teaching material later in the New Testament. But we must change our assumption that our preaching goal is to find the congregation in the text. Take the Gospels, for example. This is where we miss the most obvious point. The Gospels are telling us about Jesus. Any sermon which majors on how we are like Peter, or like the Pharisees, or like the crowds is probably missing the point. Matthew, Mark, Luke and John are writing about Jesus. So preacher, tell us about Jesus! Tell us what we learn about Him! Tell us about His character, His words, His deeds, His heart, and ultimately His sacrifice for sins and His resurrection from the grave! Tell us about Jesus, and then tell us how to respond! Don’t keep searching around for Waldo, when Jesus is so easy to find. ¹ Disclaimer: Dr Sinclair Ferguson was also preaching to about 100 other pastors at the Northern Ireland Ministry Assembly, 2012.